KIEV, Ukraine -- Yuri Leshchinsky spent more than a decade transforming an ailing Soviet-era factory into a leading candy maker. 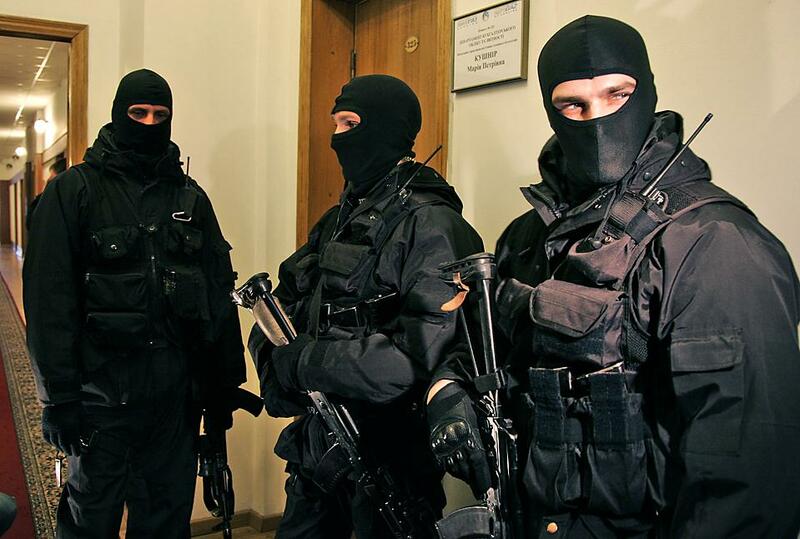 SBU security guards (formerly known as KGB), like these shown, are used in corporate raids. When a board meeting drew him to the plant from his New York home, he was in for a shock: Black-clad security guards armed with rubber batons were there to meet him, blocking his way. In the coming months, the purchase of 95 percent of the plant's shares by Leshchinsky and his U.S. partners was declared illegal through a series of court rulings. A new owner was installed, leaving the Americans out of tens of millions of dollars. The 2010 seizure of the Zhytomyr Sweets factory is one of the most prominent in a phenomenon known as corporate raiding, the alleged forced takeover of dozens of foreign and domestic companies in recent years that critics claim has the backing of Ukrainian officialdom. Investors and officials say the corporate seizures are eroding Ukraine's tottering economy by sapping badly needed overseas investment. And it is hampering Kiev's efforts to forge deeper economic and political ties with the European Union. Even the government acknowledges the gravity of the problem, calling it a "cancerous tumor on the economy" and vowing in March to fight it. But experts and opposition lawmakers dismiss those statements, saying both national and regional officials are themselves involved in the takeovers. Ukrainian-born Leshchinsky, now an American citizen, is convinced the new owner of Zhytomyr Sweets has high-level backing within the office of Ukrainian President Viktor Yanukovych, because his opponents' lawyers were employed by firms associated with the president's legal adviser. Yanukovych's office refused to comment on the claim. "The plant ... was taken away from me with the help of corrupt judges," Leshchinsky said. "Today bandits prevail among Ukrainian law enforcement who can do anything they want against the law." The new owner, former Leshchinsky employee Ihor Boiko, insists that he carried out the ouster legally and acted in the interests of the plant - accusing Leshchinsky of siphoning money from Zhytomyr Sweets. Andriy Semididko, head of the Ukrainian Enterpreneurs' Anti-Raiding Union, a Kiev-based watchdog, says that the number of forced corporate takeovers has risen since Yanukovych came to power two years ago despite his vow to stamp out the problem. "He who tamed the dragon has himself become the dragon," Semidiko said, referring to Ukrainian authorities. Ukraine dropped 21 points over the past two years to 118th out of 130 countries on the International Property Rights index compiled by the Washington-based watchdog Property Rights Alliance, which monitors property rights protection around the world. While foreign direct investment rose from $5.8 billion in 2010 to $6.9 billion in 2011 largely on the back of the global economic recovery, portfolio investment fell from $30 million worth of securities traded on Ukraine's stock exchange daily a year ago to some $6 million today, according to Kiev-based Dragon Asset Management. Natalia Korolevska, an opposition parliament member who campaigns against corporate takeovers, has likened them to modern-day piracy - the seizure of a company from lawful owners through illegal court rulings issued by judges susceptible to bribes or political pressure. A takeover usually starts when a suit is brought against a company based on a technical or even fabricated legal violation. A judge may then order the company's assets frozen and ownership transferred to the plaintiff in compensation for the alleged damages, or the company may then be resold. In another scenario, law enforcement bodies initiate criminal proceedings against a company's owner and then close the investigation in exchange for a share of the company, or even all of it. Sending investors packing is the last thing Ukraine needs as it tries to unfreeze a $15.6 billion rescue loan from the International Monetary Fund, money that has kept its economy afloat. Kiev is also facing harsh Western pressure and increasing isolation over the politically tainted jailing of former Prime Minister Yulia Tymoshenko. Leshchinsky, 61, a former wrestler who emigrated to the United States in the late 1970s, deeply regrets his decision to invest in the Ukrainian confectionary plant. In the mid-1990s, Trilini International, a Brooklyn-based firm co-owned by Leshchinsky, supplied cocoa beans, sugar and fats to Zhytomyr Sweets, based in the city of Zhytomyr, about 130 kilometers (80 miles) west of Kiev. But the Ukrainian economy was in a deep crisis and the crumbling plant needed investment. In 1999, Leshchinsky and his partners founded an investment firm called Cobisco, which bought 45 percent of the plant's stock. By 2010, the firm, which was reorganized into a Swiss-based company called Delta Capital, had acquired 95 percent of the shares, with the rest belonging to workers. Leshchinsky estimates the investment in the plant totaled some $25 million. Over 10 years, the workforce doubled to about 2,300 and annual output rose from 16,000 tons of candy and cookies to about 59,000 tons in 2009. The factory became a top taxpayer in the region and one of Ukraine's leading confectionary factories, its chocolate, candy and raisin cookies a staple of supermarkets across the country. Leshchinsky estimates that the plant was worth $120 million in 2010. All that ended in June 2010. Boiko, a top manager whom Leshchinsky had hired and brought into Delta Capital, had orchestrated his ouster. Boiko hired scores of security guards to keep Leshchinsky and his partners away from the factory. He then secured a court ruling declaring that the purchase of the plant's stock over the years had been illegal and thus Leshchinsky and his partners had no ownership rights. That decision also applied to Boiko's 25 percent shareholding at Delta. But he called a shareholders' meeting of Zhytomyr Sweets and succeeded in merging it with another firm he owned to form a new company called ZhL, an acronym for the plant's Ukrainian name - Zhytomyrski Lasoshchi. Boiko now owns 71 percent of ZhL. Even though a regional commission charged with investigating corporate takeovers in Zhytomyr declared that the ownership change appeared unfair, Leshchinsky has lost more than 50 appeals trying to win back the plant. Some 50 workers are also suing Boiko over the ownership change. Leshchinsky now warns other foreign investors against putting their money into Ukraine. "Who would do such a thing? Only somebody who is suicidal," he told the AP in a telephone interview from New York. Since the ownership change, production has fallen about 20 percent and the company slid from the fifth largest confectionary plant in 2010 to sixth largest in 2011, according to the Industrial News Agency, which monitors the food market in Ukraine. Some 350 workers have been laid off over the past two years, and many employees complain of reduced work shifts and salary cuts. Boiko accuses Leshchinsky of bleeding money from the plant by supplying raw materials and equipment at inflated prices and by failing to pay shareholders any dividends. He claims that in 2008-2009 alone Leshchinsky pocketed over $1 million by supplying cocoa oil and powder through Trilini, his commodities firm, at nearly twice the market price. "The plant was tortured for 11 years," Boiko said. "Such investors should be chased away with a stick." Boiko says he offered Leshchinsky and his partners $1 million in compensation for their initial investment into the plant, but Leshchinsky denies being offered anything. According to Boiko, the recent decline in output was due to Leshchinsky's efforts to win the company back, which have hurt its image, and import duties imposed by major foreign buyers, while the layoffs resulted from the introduction of new automated equipment. Leshchinsky says he sold raw materials at fair prices and maintains that profits had to be reinvested in order for the company to grow. He alleges that the takeover involved bribing numerous judges and government officials. He accuses Andriy Portnov, the legal adviser to Yanukovych, of implementing the raid, saying that his opponents' lawyers were connected to Portnov. Yanukovych's office and Portnov declined to comment on the allegations of their involvement in the plant's takeover, only saying that the case should be handled by courts and law enforcement bodies. The government has set up a commission to fight corporate takeovers, but Korolevska, the opposition lawmaker, compares the government's efforts to bees fighting with honey. "How are they going to fight it if they are themselves the main organizers of this process?" Korolevska asked.